Now the judge has not only allowed more people to protest, but has also ruled that activists should be permitted to use loud hailers between 2pm and 8pm, effective from tomorrow. A UK High Court judge has reversed an injunction intended to stop animal rights group PETA from protesting outside its newly-opened store in London - and quadrupled the number of protesters allowed in front of the shop. Canadian outdoor apparel store Canada Goose secured an injunction when it opened its flagship shop in Regent Street last month. According to PETA, the judge is understood to have said that the injunction was obtained without notice, and 'unreasonably restricted people's right to freedom of assembly and expression'. 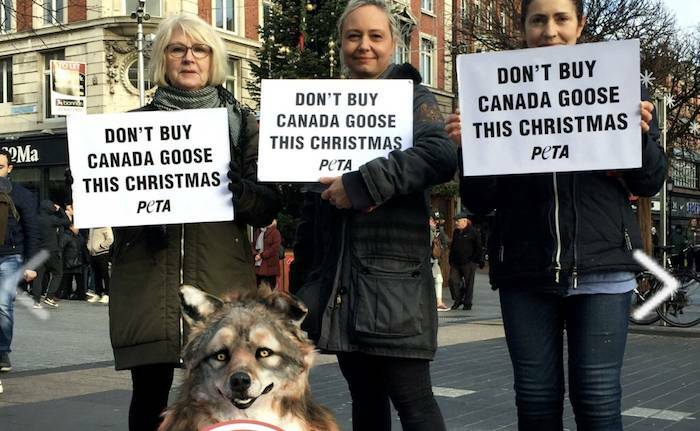 "Canada Goose's attempt to take such drastic measures to silence legitimate protests shows that we're winning," says PETA Director Elisa Allen. "If it wants to stop protests, it can - by ditching cruelly-obtained fur in favor of cutting-edge vegan materials, as Gucci and Michael Kors have both recently committed to doing." A spokesperson for PETA says of the cruel store: "Canada Goose's fur trim comes from coyotes who are caught in barbaric, bone-crushing steel traps. "They sustain horrific injuries and can languish for days before eventually dying of hunger, thirst, or blood loss. Some are so desperate to escape that they attempt to chew through their own limbs."